Deep fry the papad & keep it aside. Arrage the papad & top up the cheese mix. Anusriram has passed me , You are a sweet heart,lemonade award, super duper chef award.I am really happy to have received the awards. looks yummy and a perfect appetizer for parties. Looks very cute! Lovely blog! Loved ur blog and i loved ur header and the content on the header. looks so cute that little papads are.. nice decoration..
Great way to start a party.Looks wonderful.I do something similar,with Lijjat Papad,instead of frying it i use the microwave,make sumtng like a masala papad with cream cheese.Wonderful idea using papads! Wow! looks yummy :) wonderful idea for starter. Cool Idea! Looks so pretty too! always make with onion tomatoes,this one sounds cool too! Awesome dear.....Nice and yummy twist to the papad. Looks really yummy. Congrats on your awards too. Looks lovely! Well decorated. Thats a nice idea! I usually make it with those sweet and salt crackers. that's a very nice idea! looks so good and yummy. Thank you for visiting my site and your comments Srikar! wonderful evening snack... looks perfect too..
hii...u san these for healthy bites event,..:-) thy look so cute,..together,..
That looks so pretty and colorful, Sri! Looks like the perfect appetizer! Eating papad is no boring after you have shared this wonderful recipe. 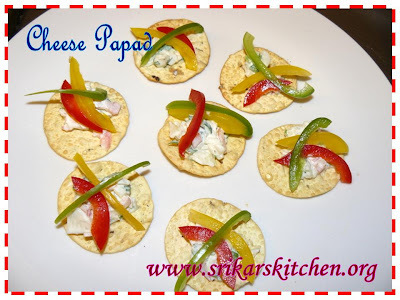 Excellent idea of making cheese papads. Great for parties.